SKF introduces high performance and quick to install device for oil and water separation in marine applications. SKF has launched a new mechanical device for the fast and easy separation of oil and water in tanks in marine and offshore applications. Sludge oil is a term commonly used to describe the waste oil mainly derived from the process of purifying fuel oils and lubricating oils in order to ensure proper operation of ship’s machinery. During the process, the separated water from the purifying process mixes with the waste oil in the sludge tank. 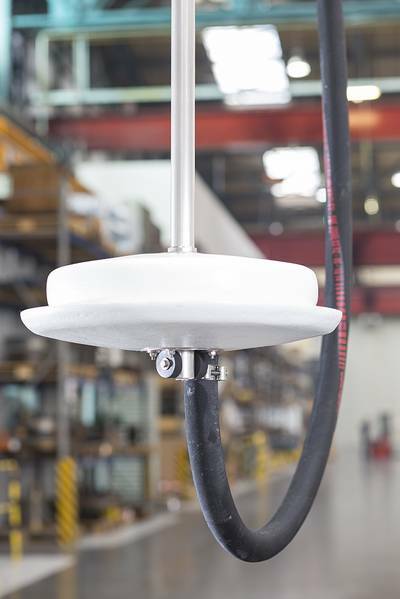 The SKF Turbulo Sludge Buoy has been developed to eliminate the need for laborious and time consuming manual drainage processes as it floats inside on-board tanks for constant, hassle-free and effective separation. In operation, the oil in the tank flows into the Turbulo Sludge Buoy’s lower compartment at a maximum rate of 6m³ per hour. It is then either pumped out or flows out under gravity depending upon whether the drain is below or above the surface of the water. This separation at the source enhances environmental performance according to ISO 14001. The resulting water left in the tank is much cleaner and easier to process in the bilge water separator, boosting its efficiency and reducing costs. Meanwhile, the free water content of the separated oil is quite low, typically less than five percent, SKF said. Consequently, it requires no further treatment and can be disposed of either in an on-board incineration plant or ashore. The product is reliable as well as quick and easy to install by the ship crew aboard all types of vessels inside existing tanks when they are opened for routine inspection or cleaning, according to SKF. Furthermore, the Turbulo Sludge Buoy is essentially a ‘fit and forget’ solution, requiring almost no maintenance and because it is entirely mechanical it does not require electricity for its operation. SKF said the solution is a one-time investment as it eliminates the need for consumables or spare parts for the lifetime of the system and the payback time is particularly short, normally less than a year. The system can be used at higher temperatures of up to 90°C and it is available in two sizes – the Turbulo Sludge Buoy and the Turbulo Sludge Buoy Mini – which can be specified depending on the available space in the tank.